Does a broken table leg in your Springs luxury apartment home throw you into a tizzy? Between cable channels such as HGTV and the availability of home improvement superstores, you don't need to be Bob the Builder to handle minor repairs. 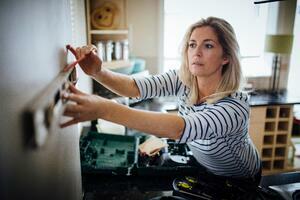 Whether you're a first-time renter or a long-term resident, you'll get deep satisfaction from being your own handyman. Here are the basic apartment tools for renters that should be in your repair kit. If you've ever had to assemble furniture, you'll understand exactly why this tool is first on the list. Make sure you have assorted types and sizes of screwdriver heads so you're not stuck trying to maneuver a Phillips screw with a flat head. Hammers also come in handy for assembling furniture as well as for hanging pictures, shelves and other items. Include a rubber mallet for jobs that need some extra force without the risk of scratches. Some materials are impossible to grip and turn without the help of a good set of pliers. Keep in mind that not all pliers are created equal, so get the right ones for the job. At a minimum you should have one set each of slip-joint, clamp and needle-nose pliers. Stop relying on car keys and steak knives to open sealed packages. Utility knives are also useful for cutting materials where precision is needed and scissors are too lightweight. Many an argument has started with someone relying on a roommate or significant other to tell them when a painting, shelf or towel bar is straight. Save your relationship and invest in a level. Even professional builders and designers wouldn't dream of "eyeballing" a measurement. This humble tool can save you untold hours of frustration and do-overs. Too-short electrical cords are more than just an annoyance: they can be a serious safety hazard. Power strips are a necessity to accommodate the numerous computers, cell phones, big-screen TVs and other devices in today's households. Duct tape may be the subject of jokes, but its versatility has no limits. Everyone knows it's perfect for patch jobs, but did you know duct tape can be used to remove splinters, hem pants and hide valuables? If you don't have the correct size nail or screw, it's not as easy as you might think to "make do" with whatever’s on hand. Inexpensive pre-made kits with assortments of nails, screws and fasteners can be found at any hardware or home improvement store. Sometimes a little dab of glue is a sufficient repair. Super glue, white glue and wood glue should handle most needs. Of course, you should then have solvents for clean-up as well as removing residue from items such as price stickers. So you have a repair that's beyond the scope of your apartment tools for renters? Contact our Springs maintenance team 24/7 for emergencies or major repair requests.